From HondaAccord89@aol.com: "My brother C.J. (dark hair) and I (Peter, red hair) marched with the Blue Devils this past summer. C.J. 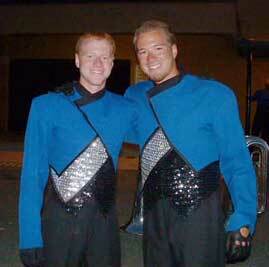 marched in 2002 with the Blue Devils and I joined him this summer. We are orginally from Tulsa, Okla. It's great to know that after the summer, countless members of the corps joined our family. Thanks for everything UPPER EUPHS!" Thanks!